“At the age of eight I still couldn’t read. I was soon being beaten once or twice a week for doing poor class work or confusing the date of the Battle of Hastings.” Richard Branson: Founder of a whole series of Virgin enterprises. She bought and she held it out in front of me….She basically bribed me back into learning with candy and money…. I’m 100% sure that if it hadn’t been for Mrs. Hill in fourth grade and a few others, I would have absolutely have ended up in jail…. [My energy] could have been directed at doing something interesting that other people thought was a good idea or doing something interesting that maybe other people didn’t like so much. Today he wants to give back to society what he got from Mrs. Hill. Through extensive licensing deals (almost 40 product lines), Tommy also offers products such as fragrances, belts, bedding, home furnishings, and cosmetics. The company’s clean-cut clothing is sold in major department and specialty stores as well as some 165 Tommy Hilfiger shops and outlets. It may be hard to believe that one of the world’s most famous actors was once just as average as everyone else, but such was the case with Tom Cruise. Tom’s father, an electrical engineer, was constantly looking for work during Tom’s childhood. As a result, Tom and the rest of his family never had the opportunity to settle down in one place. Their constant moving around was hard on the family, and especially hard on Tom. Not long after settling into Glen Ridge, NJ, Tom’s parents divorced. Tom’s mother was given custody of the children, and the tight economic situation became even tighter for the family. In addition to problems at home, being dyslexic was yet another obstacle standing in the way of Tom’s education. Not excelling in school, Tom entered a seminary for the priesthood at the age of 14. Tom left not long afterwards, and enrolled in Glen Ridge High School. Tom continued to struggle academically during his high school years. Before ever seriously considering acting in high school, Tom joined the wrestling team there. However, after suffering a serious injury he decided to do something else. That something else was acting. Tom would act in two high school musicals before graduating from high school in 1980. American Artist, Cartoonist, Movie Maker, Entertainer. Adults are only kids grown up, anyway. So said Walt Disney, the man who taught the world that, When you wish upon a star your dreams come true. As a young boy Walt Disney did a lot of wishing, and a lot of dreaming, and a lot of drawing, but very little reading, writing, and arithmetic. His struggles with traditional learning led him to make numerous comments about modern education. Crowded classrooms and half-day sessions are a tragic waste of our greatest national resource – the minds of our children. But he did not just stand back and talk about what was wrong. He made educational films and designed spaces where adult and children alike could learn about the world around them in a multi-sensory way. “I would rather entertain and hope that people learned something than educate people and hope they were entertained”. Of his success, he would sometimes observe, “All the adversity I’ve had in my life, all my troubles and obstacles have strengthened me… You may not realise it when it happens, but a kick in the teeth may be the best thing in the world for you”. But no matter what, he always believed in his dreams and encouraged others to, too. We keep moving forward, opening new doors, and doing new things, because we’re curious and curiosity keeps leading us down new paths. When you believe in a thing, believe in it all the way, implicitly and unquestionable. For Jamie Oliver, working in his father’s pub from childhood prevented him from ever being shy, even around the smart kids at school. My dad got sent all the quiet kids in the village to work at the weekend. “Trev, look after our daughter, will you? She’s just a little bit quiet. Just a little bit shy.” Dad would put her on the buffet for a month over summer, and by the end she’d be the most outgoing bird. You can’t be shy in the pub trade. It’s almost impossible. Another thing his father taught him was that hard work paid off. He paid Oliver for working in the kitchen at the pub, where Oliver also received his earliest training in food. “I’m sure everyone thought I was a spoiled brat. I always had whatever trainers I wanted, and I can honestly say I earned every single penny. My old man never gave me hand-outs. Ever. In fact, he was repulsed by the idea”. Unlike many television chefs, he has struck a true note between what is perfect and what is good enough. I haven’t been able to do the things I’ve been able to do by having an act. Love me or hate me, my recipes or ways of doing things have all been sincere. You know I could do a beautiful tart now, but you know what? When you haven’t got the time, smash up some Maltesers and pour them over ice cream. Genius! – Painter, Designer, Scientist, Futurist and Thinker. One remarkable indication that Leonardo was dyslexic is in his handwriting. Leonardo was constantly sketching out his ideas for inventions. Most of the time, he wrote his notes backwards. Why did Leonardo write from right-to-left, in mirror image? Although unusual, this is a trait shared by many left-handed dyslexic people. Most of the time, dyslexic writers are not even consciously aware that they are writing this way. There are too many successful dyslexics to mention them all on one website. What is important to note with all of these famous dyslexics is that they embraced their differences and pursued their strengths. 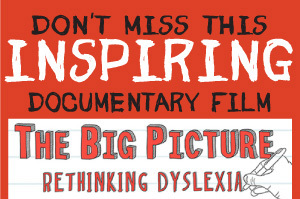 Dyslexia can be a gift rather than an impediment as it teaches an individual to think in new and innovative ways.